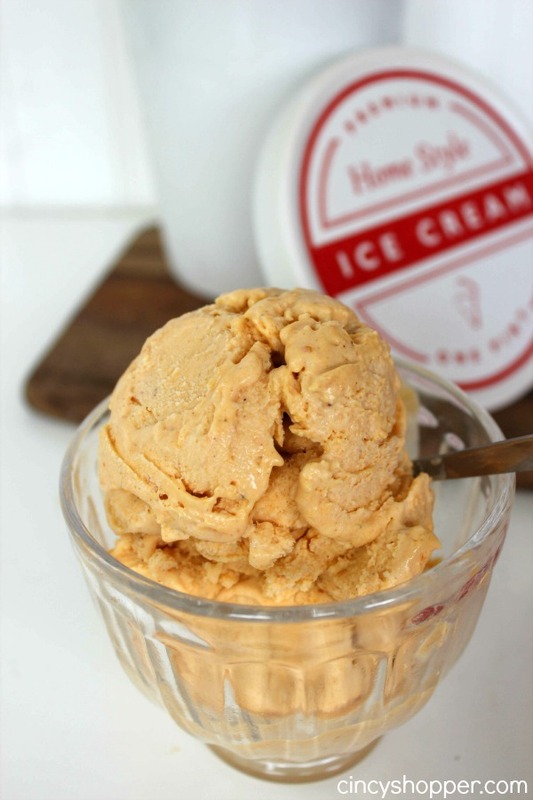 Fall is going to be here before we know it and this Easy Pumpkin Pie Ice Cream Recipe is going to be your favorite fall ice cream. I have been making quite a few ice cream recipes lately. So I decided to to do some experimenting with some fall flavors. When I think of fall, pumpkins and apples are the first flavors that come to mind. My Blueberry Cheesecake Ice Cream Recipe was so easy to make and everyone really enjoyed it. 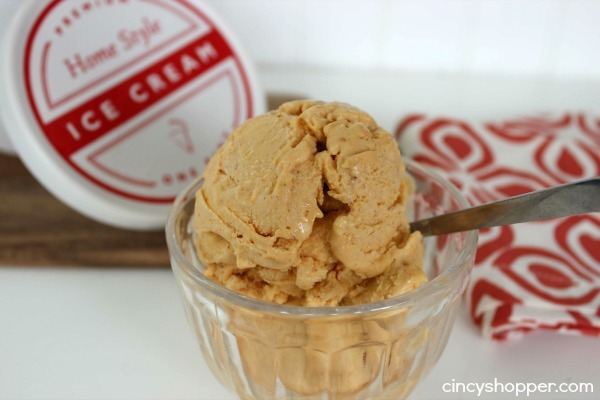 Making this Pumpkin Pie Ice Cream Recipe was so easy. This No Churn Ice Cream Recipe is easier than making the Blueberry Cheesecake Ice Cream. This Pumpkin Pie Ice Cream Recipe is will have the yummy pumpkin flavors of fall in ice cream form. So delish! My hubby is not a HUGE Pumpkin Fan and he really enjoyed this ice cream. The flavors are not overwhelming but still full of great pumpkin pie flavors. The ingredients needed for this easy ice cream are so simple. 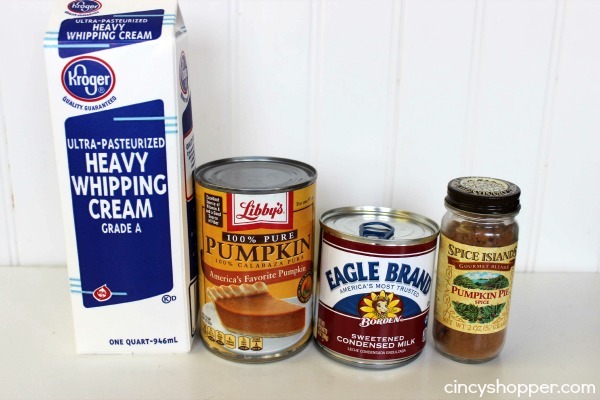 Just grab some heavy whipping cream, pure pumpkin, sweetened condensed milk and Pumpkin Pie Spice. If you do not have pumpkin pie spice you can use nutmeg, cloves and cinnamon. I really like having a Pumpkin Pie Spice on hand during the fall. No need to search for all the spices in the cabinet to create the pumpkin pie flavors. Be sure to grab yourself some Pumpkin Pie Spice this fall to make it easier for you too! Every time I have tried to make my own ice cream it never turns out. This looks like it will work. Pinning and going to have to try it. Thanks. 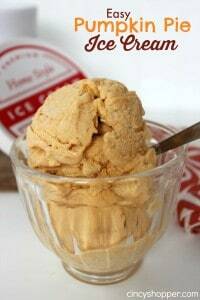 I love pumpkin ice cream! There was a store here that used to carry it, but I don’t know if they do anymore. I’ll try this instead. 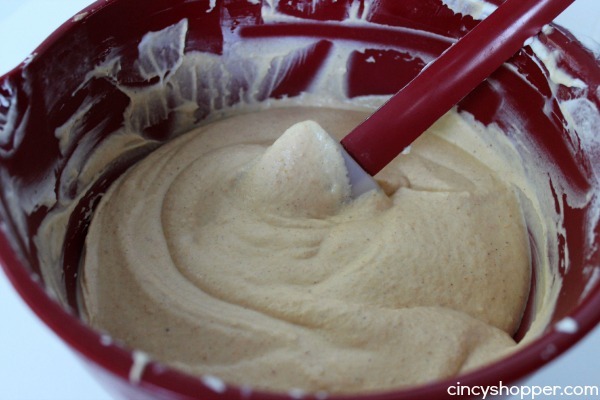 Could you use an ice cream maker with this same recipe? I am wondering the same thing, will this work with an ice cream maker? Would I combine all the ingredients first then pour in or follow the directions? It looks and sounds DELICIOUS !! Whoo! I LOVE PUMPKIN! I saw your post from “What’s Cooking Love” Thursday Link Party. So I was tempted to check in here :) I will try this for Thanksgiving Day while watching Superbowl College Football games :) I pinned! Thank you for sharing! Oh, goodness. Ice cream is my weakness and this looks so yummy! I’ll be featuring your recipe at The Scoop link party this coming Monday. Thank you for linking up! I picked a quart of Pumpkin Ice Cream at Trader Joes last week. It was very good and I especially liked it in my coffee! I just made this ice cream with my 3 kids and it was delicious. Thank you so much for this recipe! It will definitely be a new fall favorite. Hi Jen! The ice cream recipe sounds so delicious and easy! I haven’t tried making ice cream in this manner but I’m very anxious to give it a try! You have an amazing blog! How do you find time to write, cook, be a wife, and an amazing Mother of 5? You are such an inspiration! Thanks for sharing here with us! I am printing out a lot of your recipes to try! Have a wonderful day! Blessings from Bama! This looks like one fabulous recipe!! I love fall inspired food! :-) I would love for you to stop over and say hello! Made this last night and had a few worries. First, it was so little cream! However, that worry was laid to rest as soon as I whipped it up with the other ingredients. It makes a decent amount of ice cream, and definitely more than enough for my dinner with friends tonight (we need at least 4 servings). After whipping and mixing everything up, I became nervous again. The batter was delicious, but I doubted whether the consistency of the ice cream could be preserved frozen. I mean, wouldn’t it be too hard? Or too soft? After leaving it to freeze for the night, I, with two taste-testers, had a bite this morning. This recipe gets 5 STARS! Seriously, it is the perfect ice cream texture, thick, delicious. The flavor is definitely pumpkin and I love that! It reminds me a lot of the pumpkin pie blizzard at Dairy Queen- I’ll just add crumbled up Nilla Wafers and it’ll taste just like it. Also, it was SO easy to make. Seriously, it took me 10 minutes. The most demanding part was cleaning up. Thank you!!! !